Adobe has just announced this evening that they have formed a partnership with Google and Yahoo! to enhance the searchability of SWF content by helping their spiders run SWF files in the Adobe Flash Player runtime. So what does that mean? We are giving a special, search-engine optimized Flash Player to Yahoo and Google which is going to help them crawl through every bit of your SWF file. This Flash Player will act just like a person would in some cases. It will click on your buttons, it will move through the states of your application, get data from the server when your application normally would, and it will capture all of the text and data that youâ€™ve got inside of your Flash-based application. Weâ€™ve basically provided a very powerful looking glass into SWF files so Google and Yahoo can pull out meaningful information. Going a bit further, Justin Everett-Church also has a good post where he explains that content producers do not have to do or change anything for their SWFs to be indexable. My guess is, however, that as developers find out what Google likes best, they'll start building with that in mind. Knowing that will be the case, this announcement could have a huge impact on frameworks such as SWFAddress and other means developers have used recently to help make content more visible to search engines. One key thing to note is Ted Patrick's post in where he makes a point to mention that dynamic data will also be indexed in the process. Considering I build most of my projects with the content being pulled from XML or some other data source such as SWX, this is great news as well. It seems like the only search engine company left out of the party was Microsoft. As Brooks mentions, I'd bet Microsoft is not interested in offering a service which enhances a direct competitor's platform file format to their Silverlight. It is a shame, but I doubt it will have much of an effect on the Flash community. You can find more information on the Adobe Developer Center SWF searchability FAQ and in Google's official announcement. Rob Ford, founder of The FWA, and Taschen Books have posted a virtual copy of their upcoming book "Guidelines for Online Success" for viewing before the print version hits bookstore shelves. I ended up spending about an hour flipping though the virtual edition, and this is both a great reference and a great source for inspiration. I have previously posted about several of the smaller Taschen web design books, and while those are great for inspiration, I always felt they lacked any educational component. 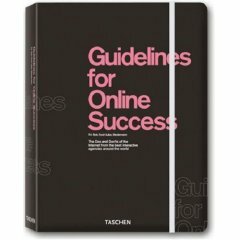 "Guidelines for Online Success" takes the normal screenshots of amazing interactive projects and then discusses what makes them amazing, how you can learn from their success, and how to avoid some possible pitfalls. I have a feeling as soon as I get my copy, it'll become a well used resource for both inspiration and interactivity guidelines. Every agency should have at least one copy of this book, so pre-order a copy from Amazon.com today. This week Didier Brun released his Liquid Components set, which I have previously blogged about, as open source. The component set is written in AS3, and provides a simple alternative to those provided by Adobe with Flash CS3, in a similar vein as Keith Peter's MinimalComps.